It will always be Lucasfilm Games(tm) to me, never LucasArts. They changed the name a year or so before I left when they rolled a bunch of divisions into this new company called LucasArts and the games group was one of them. 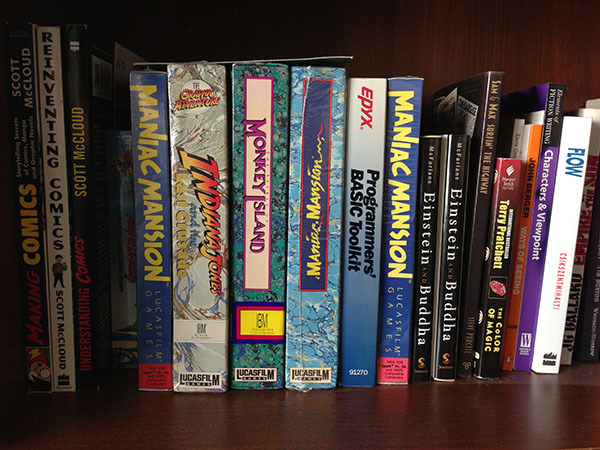 Many years later, all that was left in LucasArts was the old games group, so the name became synonymous with games. It's hard for me not to be sad. I haven't worked there since 1992, but it was still home to me. I grew up there. I learned just about everything I know about designing games there. I became a real programmer there. I made lifelong friends there. Eight of the most memorable and influential years of my life were spent there. I would not be who I am today without Lucasfilm Games. I was hired at Lucasfilm Games by Noah Falstein as a Commodore 64 programmer porting his game Koronis Rift from the Atari 800. I had just been laid off from a company called Human Engineered Software (my first job) and had moved back to Oregon and was about ready to start college again when the phone rang. It was someone (I don't remember who) from Lucasfilm Games and they were looking for a Commodore 64 programmer and wanted to know if I was interesting in coming in for an interview. Holy Crap I said/thought/shouted to myself. I didn't even know Lucasfilm made games. Lucasfilm as Star Wars and the foundation of my childhood. I idealized George Lucas and ILM. I said I could come in for an interview that week and immediately packed my car and moved back to California. I just moved back. There was no way I wasn't going to get that job. I vividly remember interviewing in an office with Noah and Aric Wilmunder explaining the way you wrote pixels to the C64 screen using their screwed up memory mapping. They seemed impressed. Or confused. Either way as long as I got the job. My first week at Lucasfilm Games was mind blowing. I had never met a smarter group of people in my life. From Noah to Aric to Gary Winnick to David Fox to Chip Morningstar to Doug Crockford. I had so much to learn. The first time I met George Lucas was kind of a disappointment. It was the 10 year anniversary of Star Wars and he and Steven Spielberg and shaved their beards to sneak into a show. I wanted to met the iconic George Lucas with a beard. When that person from Lucasfilm first called I almost didn't answer the phone. I was on my way out to met a friend for lunch and had just locked the front door and was halfway to my car. I don't know what caused me to go back inside and answer the phone. If I hadn't, I would have had a very very very different life. I still have hope that I might get the rights to Monkey Island back someday. LucasArts shutting down doesn't change anything since Disney bought them back in Oct. Maybe there will be less of an emotional attachment to it for them. Who knows. Not me. I'm the opposite of a Pack Rat. I don't know if there is a catchy word for that, but that's what I am. I get antsy if I can't move from one place to another by throwing everything I own into the back of my car. Gee, I wonder why? This is the sum-total of my collection of the games I have worked on over the past 20+ years. So many missing ones. Nothing from the years at Humongous Entertainment. No Monkey Island 2. At least they are all still in shrink wrap. What is two + two + three?